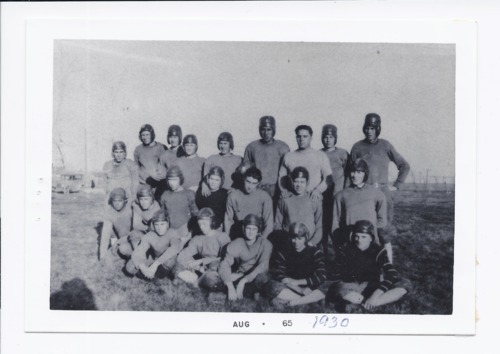 A photograph of the 1930 Rossville High School football team. Pictured in the back row, left to right: Clyde McCollough, Fred Heiland, Clifford Cormack, Tuffy Ruff, Tony Dean, Chow Nadeau, Coach Charles Kimerer, Earl Wilt, and Chuck Denton. In the middle row are Theo. Jones, Rosy Williams, Howard Stevens, Don Meade, Micky McGuire, and Fred Zickefoose. Sitting on the ground are Pete Baird, Clark Meyer, Riley Whearty, Dale Page, and George O'Donnell. This photograph is provided through a pilot project to host unique cultural heritage materials from local libraries on Kansas Memory and was accomplished by mutual agreement between the Northeast Kansas Library System, the Rossville Community Library, and the Kansas Historical Society.